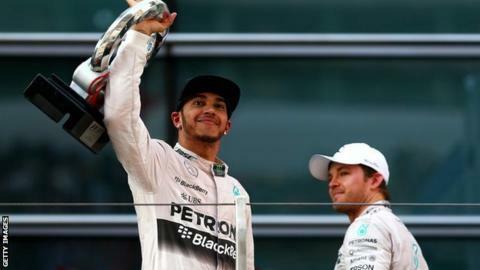 Britain's Lewis Hamilton won in China to extend his championship lead to 13 points. Mercedes' Nico Rosberg says his latest row with team-mate Lewis Hamilton is a "thing of the past" following talks after Sunday's Chinese Grand Prix. The German had accused race winner Hamilton of deliberately driving slowly to back him up into the chasing Ferrari of Sebastian Vettel. Hamilton denied the charge and Rosberg says the matter has been resolved. "It was definitely tense after the race but we had a good sit down, a good discussion," he said. Mercedes F1 boss Toto Wolff had earlier said the drivers had cleared the air in their post-race debrief. And backing up those claims, Rosberg added the team was now focused on the next grand prix. "There was a lot of constructive criticism and now for everybody it is a thing of the past and we're moving on to Bahrain," he insisted. The fall-out was the latest post-race spat between the pair since Mercedes started to dominate Formula 1, including a collision involving the two at last August's Belgian Grand Prix.